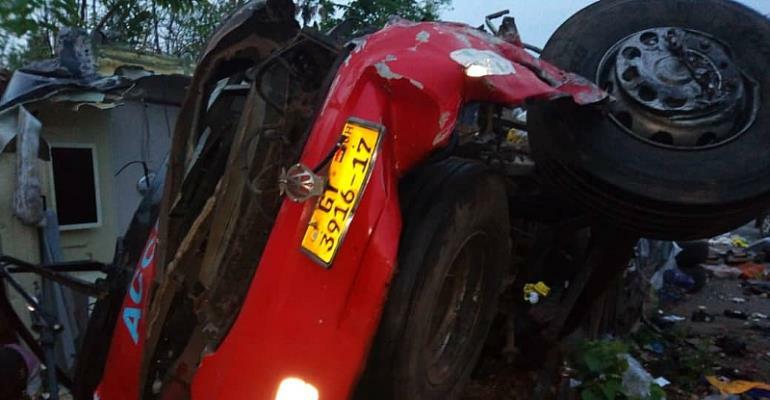 The chairman of the National Democratic Congress (NDC) at the Winamda Polling Station in the Sekyere Afram Plains Constituency lost the wife and two daughters in the recent ghastly accident that occurred on the Amomoa-Nkwanta stretch of the Techiman-Kintampo Highway last Friday. The deaths of about 60 people in the accident have sparked another round of heated debate over road safety in the country due to the high number of casualties involved. This paper gathered that the NDC Chairman's wife and children were part of those who got burnt beyond recognition, which compelled the authorities to organize a mass burial for them. He said the NDC in the Winamda Polling Station and Sekyere Afram Plains in general have been devastated by the development. Mr Fuseini disclosed that the chairman's wife travelled to the northern part of the country to get her two daughters to start school at Winamda. Unfortunately, the VVIP ANKAI bus with registration number GT 39116-17 on which they were travelling from Garu in the Upper East Region to Kumasi collided with the Kia Grand Bird Bus with registration GT5694-18, which was heading towards Bolgatanga from Accra.